CRUISIN AUTOMOTIVE are the only W.A. dealer for FAST – Fuel Air Spark Technology. FAST make Self Tuning Fuel Injection Systems. 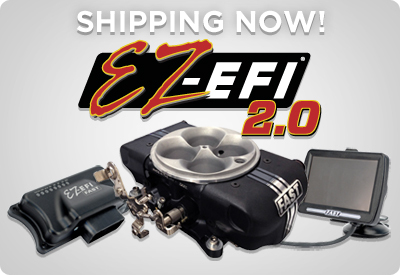 There most popular product is the EZ-EFI Fuel system. With over seven years of proven performance and reliability, there is no easier choice for EFI. Designed for applications making up to 650 horsepower, the EZ-EFI Fuel system easily installs on any carburetted or multi-port application in a single afternoon. No manifold replacement is needed. The die-cast four-barrel injector throttle body with integrated fuel rails uses existing OEM-style carb throttle linkage and sensors. It also works with all ignitions, including HEI, and features a premium mesh-wrapped wire loom with additional protective fuses. Simply hook the system up, answer the simple Setup Wizard questions on the hand-held touch screen to get the engine started, and the system will tune itself as you drive. No laptop or tuning experience needed! EZ-EFI Fuel Base Kit. SKU: 30226-06KIT. KIT INCLUDES: Engine Control Unit (ECU); Colour Hand-Held Touchscreen Unit w/ Mount; 650 HP-Capable Throttle Body w/ integrated Fuel injectors, Sensors & Rails; Mesh-Wrapped Wiring Harness w/ Protective Fuses, Wide-Band 02 Sensor; Installation Hardware; & Chrome EZ-EFI badge. EZ-EFI Fuel Master Kit w/ In-Tank Fuel Pump Kit. M: 30447-06KIT. EZ-EFI Fuel Master Kit w/ Inline Fuel Pump Kit. M: 30227-06KIT.